This article first appeared in Prosit in June 1977. 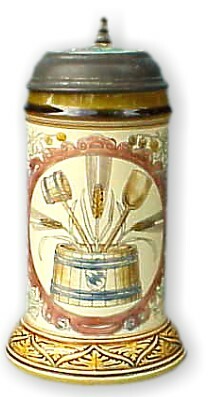 With the devotion to the work ethic so important to the Germans it is not surprising that the German stein makers produced many steins with motifs dedicated to the various trades and professions. There is hardly a profession or skilled trade that was not honored by a stein depicting the tools, or some related facet of the occupation or profession, including the military. And we can conclude from the quality and artistry of the fashioning of these steins that they were not to be used as a daily drinking vessel. More likely they were presentation pieces, on the occasion of a marriage, graduation, promotion, or as an award in a contest, to be kept in the family as a cherished memento. 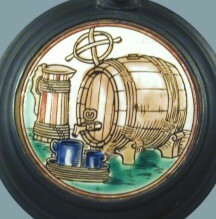 There were, and still are, a great many manufacturers of steins and all of them seemingly devoted some of their output to honoring the skilled trades, but one will be hard put to find anything as well designed and as imaginatively decorated as the twelve steins turned out by Villeroy and Boch at Mettlach around the turn of the century. 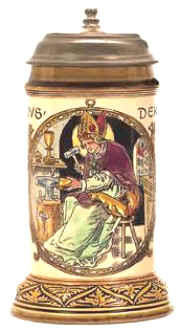 Most Mettlach collectors are familiar with the book steins which considered the various professions and, other than the fact that the insert lids are different showing some aspect or insignia and the titles on the book spines carry the author's names and the titles of authoritative works of the profession, they are pretty much the same. And even at this late date in the field of collecting it is still possible to put together the complete collection. There are twelve in the series, all one half liter in size, with a deep hollow bottom giving it the appearance of a one liter. All have insert or inlay lids and were available only with the inlay lids as compared to the other Mettlachs for which a choice of pewter or inlay lids was available. The thumb-lifts are plain and undistinguished and all similar. Their cost from the factory in 1906 was 4.90 marks complete, a considerable sum in those days and would cause its owner to hesitate to use it as a drinking vessel on a steady basis. There is no question but this is a group of outstanding steins and the object of many Mettlach collectors. Congratulations to those of you who have them in your collections; to those of you who are in quest of them, lots of luck. #2719 - Baker - lions rampant on a shield over a crowned pretzel. 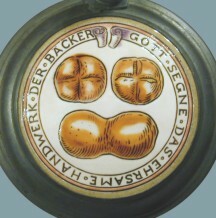 On the back of the stein: "God bless the honored hand work of the baker". Inlay lid depicting rolls or bread. #2720 - Tailor - mounted cavalier with town of Kathenow in the background. 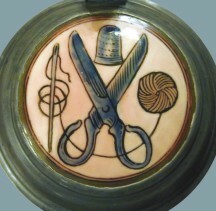 Inlay lid shows scissors, thread, thimble, and needle. On the front of the stein is incised: "George Baron von Derfflinger, Elector of Brandenburg, General-Field Marshall and Councillor of War 1606-1695. A master tailor and the son of a peasant. #2721 - Cabinet-maker - Inlay lid shows tools of the trade - nails, square, dividers, chisel, etc. On the body of the steins: "At the beginning and the end, at the cradle and the grave, there must the hands of the cabinet-maker be." 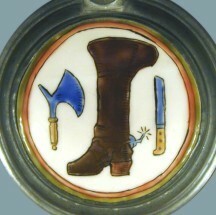 #2722 - Shoemaker - Jack Boot and leather tools on inlay lid. 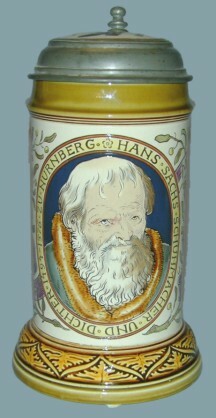 On the body of the stein is a dramatic portrait of Hans Sachs and on the ribbon surrounding it, "Hans Sachs was a shoemaker and poet." Hans Sachs was a German Meistersinger born in Nürnberg and an itinerant shoemaker. He studied the art of Meistergesand from 1511 to 1515, and began writing in 1514, composing 6000 works including tragedies, comedies, songs, fables, allegories and narratives. At the reformation he accepted the doctrine of Martin Luther. He was depicted as the central figure in Wagner's opera "The Meistersinger of Nürnberg" in 1868. #2723 - Carpenter - on the inlay lid are a pine tree and the words Erlebe hoch! 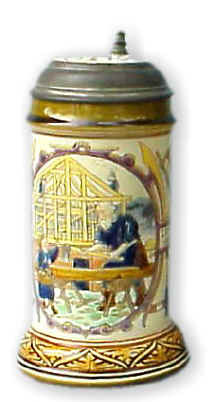 The excellent picture on the front of the stein shows a bearded carpenter and a child working at the carpenter's trade, and if it were not for the contemporary look of the framework in the background, it is possible that the figures are to represent Joseph and the child Jesus at work. 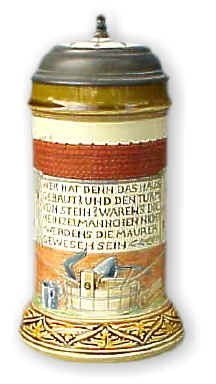 The translation on the back of the stein is "God bless the happy carpenter's handwork." 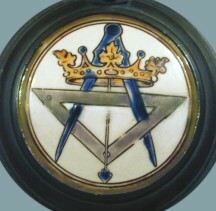 #2724 - Mason - Triangle, compass and crown on inlay lid. "Who indeed built the house and the tower of stone, if it wasn't the Heinzelmännchen, it must have been the mason." 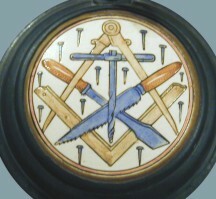 On the body of the stein are a mason and helper building a wall with the tools of the trade on the front. 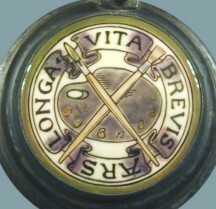 #2725 - Artist or painter - palette and brush on inlay lid with the Latin inscription Vita revis ars longa - "Life is short, art is forever". 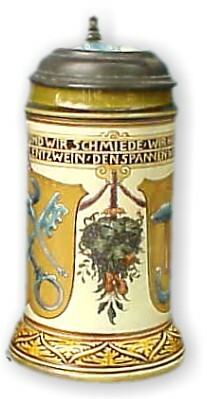 On the front of the stein is a maiden, antlers, and crown. 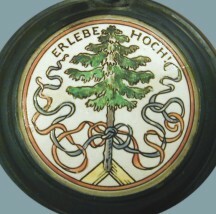 On a ribbon is the saying: "This is the artist's ancient coat of arms." #2726 - Goldsmith - on the front of the stein is a Bishop making a gold cup on an anvil, flanked on either side by shields. 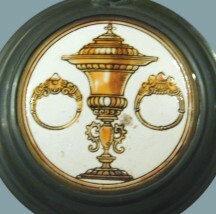 A ciborium is on the inlay lid. Inscription reads "St. Elegius, patron of the goldsmith". St. Elegius or St. Eloi, a French ecclesiastic who lived from 588 to 659 A.D., learned the goldsmith trade and gained the favor of Clotaire II by skill in making a throne. He was chief counsellor to Dagobert I, Bishop of Noyon in 639 A.D. and is the patron saint of goldsmiths. #2727 - Printer - this is probably the most dramatic of the occupationals. 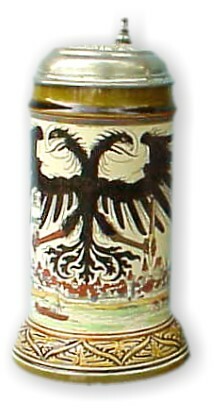 On the front of the stein is a double-headed black eagle with printing implements in its talons. On the inlay lid is inscribed "Long live the noble printer's art." On the body is the date and town of Mainz where the first moveable type was invented by Johan Gutenberg. Strangely, however, Gutenberg's name is not shown. 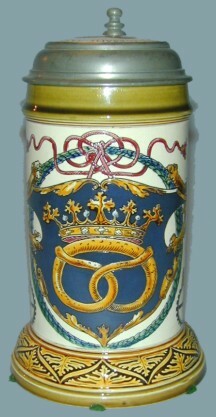 #2728 - Brewer - body of stein shows a barrel with a Bavarian shield and brewers tools. 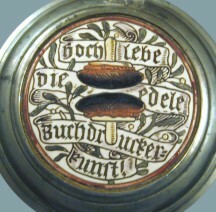 Inlay lid shows a barrel and stein. Inscription reads: "Hops and malt - may God preserve them." #2729 - Locksmiths and smithies - two shields are shown on the body - on one a hammer, tongs, horseshoe and coiled and crowned snake - on the other tongs and keys. The inscription on a double band above the shields reads: "We locksmiths and we blacksmiths, we are at peace with one another, and whoever wants to separate us, we will lock into the vise." 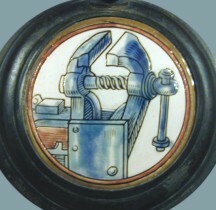 The inlay lid depicts a vise. 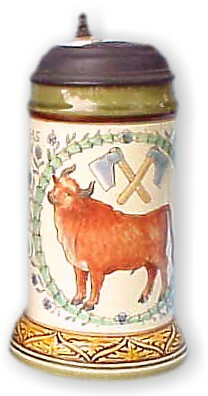 #2730 - Butcher - standing ox with crossed cleavers above it. Inscription on sides reads: "If the ox were born without bones, then it would certainly be better on the scales." 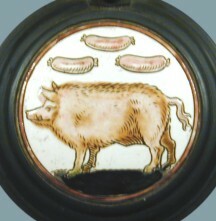 On the inlay lid is depicted a pig. We would like to acknowledge the help of Jack Lowenstein, John Crowley, Bill Sullivan and Gene Smith, all members of SCI, in the preparation of this article.